In this stunning new novel, the acclaimed author of The Plum Tree merges the past and present into a haunting story about the nature of love and loyalty--and the lengths we will go to protect those who need us most. Ten years ago, Izzy Stone's mother fatally shot her father while he slept. Devastated by her mother's apparent insanity, Izzy, now seventeen, refuses to visit her in prison. But her new foster parents, employees at the local museum, have enlisted Izzy's help in cataloging items at a long-shuttered state asylum. There, amid piles of abandoned belongings, Izzy discovers a stack of unopened letters, a decades-old journal, and a window into her own past. Clara Cartwright, eighteen years old in 1929, is caught between her overbearing parents and her love for an Italian immigrant. Furious when she rejects an arranged marriage, Clara's father sends her to a genteel home for nervous invalids. But when his fortune is lost in the stock market crash, he can no longer afford her care--and Clara is committed to the public asylum. Even as Izzy deals with the challenges of yet another new beginning, Clara's story keeps drawing her into the past. If Clara was never really mentally ill, could something else explain her own mother's violent act? Piecing together Clara's fate compels Izzy to re-examine her own choices--with shocking and unexpected results. 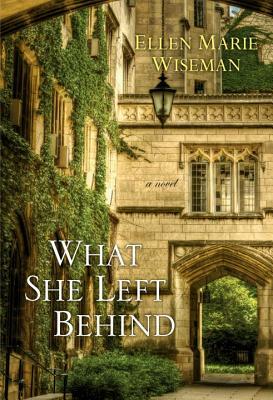 Illuminating and provocative, What She Left Behind is a masterful novel about the yearning to belong--and the mysteries that can belie even the most ordinary life. Ellen Marie Wiseman was born and raised in Three Mile Bay, a tiny hamlet in Northern New York. A first generation American, Ellen has traveled frequently to visit her family in Germany, where she fell in love with the country’s history and culture. A mother of two, Ellen lives peacefully on the shores of Lake Ontario with her husband and three dogs.